The six men of the International Space Station's Expedition 28 crew are not just devoted astronauts and cosmonauts, they're also devoted dads. 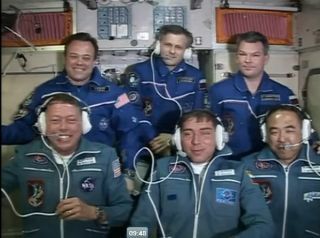 Here, the crew speaks with their family and friends on June 12, 2011 after a Soyuz delivered three new crewmembers to the station. The six men flying on the International Space Station are a dedicated and diverse crew, but they're also devoted dads and this Father's Day finds them stuck in orbit, far from home. Luckily, some modern technology keeps their family just a phone call away. An Internet and email link, video conferences and an Internet protocol telephone help the space station crew stay in touch with family and friends on Earth during holidays and special occasions as they sail 220 miles (354 km) above Earth. That communications gear will likely get a work out for Father's Day on Sunday, June 19 since, aside from some daily station upkeep, the crew typically has weekends off. Kenny Fossum, right, youngest son of Expedition 28 NASA astronaut Mike Fossum, is seen at Russian Mission Control in Korolev, Russia speaking to his father shortly after his arrival at the International Space Station on Friday, June 10, 2011. Fossum's wife Melanie, just left of Kenny, smiles nearby. One of the men on the Soyuz was veteran NASA astronaut Mike Fossum, who has four children and one grandchild. Fossum's wife, three of their sons, and his brother Terry watched the Soyuz rocket launch from the central Asian spaceport of Baikonur Cosmodrome in Kazakhstan. "That was a fantastic launch, the six months up there will pass in no time, and I hope you have fun," Fossum's youngest son Kenny, a teenager, told his father by phone in a June 9 EDT video conference after the Soyuz arrived at the station. "It will go by fast, I look forward to seeing you," Fossum replied. "I miss you already." In addition to phone calls or email, astronauts on the space station can also send messages or photos to family and friends via Twitter using an Internet connection provided by Mission Control. "That beautiful view never gets old," wrote Garan, 49, who posts under the name Astro_Ron. NASA astronaut Ron Garan posted this view of an Earth sunset seen from the International Space Station on June 12, 2011. Fossum, 53, is currently a flight engineer with the station's Expedition 28 crew. Later in the flight, he'll take command of the station's Expedition 29 mission. Fossum launched into space with two crewmates: Japanese astronaut Satoshi Furukawa (who has two children) and Russian Sergei Volkov, who has one son and is himself the son of noted veteran cosmonaut Alexander Volkov. Two other cosmonauts round out the station crew. They are: Alexander Samokutyaev, who has a daughter, Anastasia, and the station's current commander Andrey Borisenko, who has a son, Ivan. Like Garan, Fossom and Furukawa send messages to Earth via Twitter. Fossum posts updates as Astro_aggie (a nod to his Texas alma mater), while Furukawa writes as Astro_Satoshi. After Fossum and his crewmates arrived at the space station on June 10, his wife Melanie assured him that the entire family is behind him. "We're very proud of your training, for what you've accomplished, your training and getting to where you are right now," Melanie said. "We're very eager to have you back to share in all that you've been through in this great mission. Go with our blessing and God's protection." Space station astronauts can train for two years or so for their six-month trips to space. Because the space station was built by five different space agencies (NASA and the agencies of Russia, Europe, Canada and Japan) representing 15 different countries, the training requires long periods away from home and family, astronauts have said. "You guys have the hard job, standing on the sidelines and watching us take off and do this," Fossum told his wife. "Thank you very much and God bless." Fossum's eldest son Mitch also watched his father's launch on the Soyuz. The launch, he said, was brilliant. "You guys had a fantastic launch the other day. It was pretty bright against the dark night sky," Mitch told his father on June 9. "That brightness is still burned into my cornea." Mitch ended his call to his father by wishing him good luck and a fun trip in space. "Thanks Mitch, this is one heck of a ride, buddy," Fossum told his son. "Love ya."